According to Javier Castellano's agent Mike Lakow, Castellano will ride Audible in the Ky. Derby and Johnny Velazquez will ride Vino Rosso. That leaves Bolt d'Oro open. Also leaves Noble Indy open. Not only do jockey agents try for the elusive Derby but they also have long time barn commitments to consider. Ruis will find somebody for Bolt but he's already burned bridges with Gary Stevens and Corey Nakatani in his brief training career, guessing Victor Espinoza is up next? I thought it terribly interesting in pre-race interviews when Ruis said he told Javier "you better not be more than a length and a half off Justify" and then came Javier's interview in the saddling area, when asked where he thought he'd be, "up close, not too far away from the leader, but then I'll have decisions to make as the race develops". One does have to wonder a bit, if the pace was slow as the clock suggested, why wasn't Bolt right up on the lead? I'm probably reading too much into the whole thing, but I know there are trainers who just say "I'll leave it up to the jock when the gates open" and I'm beginning to think Ruis just might be giving too many instructions to these HOF guys. Luis Quinonez, Oaklawn's leading rider in 2007, will see a specialist Monday to determine the extent of a back injury suffered before Saturday's second race, his agent, Monty Penney, said Sunday morning. Penney said Quinonez sustained a “compression fracture” of his “T4” vertebra when Siblyline reared in the gate and unseated the jockey. Quinonez was able to move his extremities, but he was transported by ambulance to CHI St. Vincent Hot Springs for treatment before being released later Saturday, operations director Jason Milligan said. Quinonez, 51, is among the winningest riders in Oaklawn history with 582, including nine this year. Penney also represents Jareth Loveberry, who was injured during training hours Sunday morning when his mount stumbled and fell leaving the starting gate. Loveberry was transported by ambulance to CHI St. Vincent after sustaining an injury to his left arm, Milligan said. thanks for that info Stark - I was hoping victor would ride him - its the best thing that could have happened to Bolt for the KY Derby - love the horse - tries hard every time - will be rooting hard for him to win those roses. Meant Tobe Mine won the ninth race at Gulfstream Park April 8. Mike Allen, who has been on both ends of enough photo finishes to know the score, had a quick quip for Samy Camacho after their mounts crossed the wire together in the first race at Tampa Bay Downs. Robbie Davis, who hasn’t ridden in a pari-mutuel horse race in nearly five years, will make his return to competitive riding Wednesday at Aqueduct. He will ride Dublin Green, a horse he owns and trains, in the fourth race, a maiden special race going six furlongs on the turf. Davis 56, won 3,382 Thoroughbred races in a career that began in 1981. He left regular race riding in 2002 due to chronic knee pain. He rode one race in 2011 and five in 2013 in two aborted comeback attempts. In 2010, Davis underwent knee replacement surgery. Davis said Saturday he feels “better than I have in the last 15, 20 years. Davis said he has his weight down to 124 pounds. If he’s a pound or two over come Wednesday, he hopes the connections understand. Davis, who trains five horses of his own including Dublin Green, said he hopes Wednesday is the first step toward a return to regular race riding. Best o'luck to Cherie DeVaux as she leaves TeamChadBrown to hang out her own shingle. Has anyone here heard anything about something happening to TVG's Kurt Hoover? I tuned into TVG a little while ago and caught the tail end of a conversation between the guys on The Quarters, and it sounded like they were wishing him well, hang in there kind of stuff. I don't know if they were referring to injury or illness or what...but what I heard worried me. Kent Desormeaux was suspended four days by the stewards at Santa Anita for his ride on Calculator in the Kona Gold Stakes on Saturday. It was four days instead of three because it was his second offense in 60 days. He should have been better friends with Kendrick Carmouche, whose mount slammed into Dublin Green coming out of the gate! According to the Equibase chart, One of Davis' feet popped out of its stirrup, but he managed to get it back in and complete the race, never getting out of last place. Hopefully, the next ride will be less eventful! A toe fracture will sideline top local rider Evin Roman for about three weeks. Roman, leading rider at the winter meet and 2017 Eclipse Award winner as outstanding apprentice, sustained the injury Tuesday morning at Santa Anita. Roman was on a skittish 2-year-old when the horse ducked. Roman jumped off, and the horse stepped on a left toe. Veteran Hong Kong jockey Nash Rawiller was suspended 15 months on Wednesday after betting on two horses that he rode and providing tips on his mounts, according to a statement released by the Hong Kong Jockey Club. The suspension takes immediate effect through July 25, 2019, and comes days before the 43-year-old Rawiller was scheduled to ride Mr Stunning in the Group 1 Chairman’s Sprint Prize at Sha Tin Racecourse in Hong Kong. Rawiller was removed from his four mounts at Wednesday's meeting at Happy Valley Racecourse. Rawiller, a former leading rider in Sydney, Australia, has ridden in Hong Kong since September 2014 and ranked third in the standings at the current season through Tuesday with 40 wins. Nice story about Mandella's long-time groom. Love the picture! 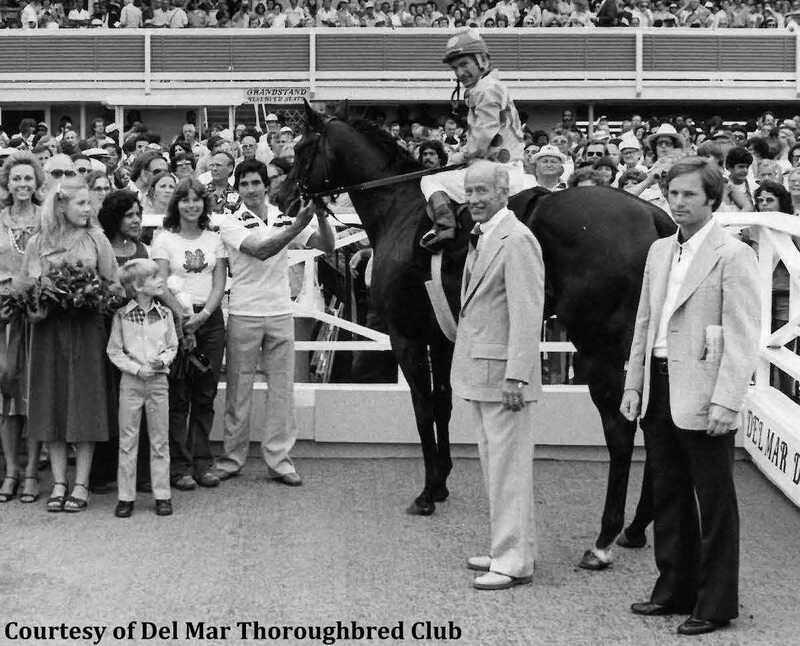 Groom Felipe Pulido Mendoza holds 1978 Bing Crosby winner Bad 'n Big (Bill Shoemaker aboard) at Del Mar for trainer Richard Mandella (far right). Second person to Felipe's right is his wife, Irene Gonzalez De Pulido. Future trainer Gary Mandella stands in front, looking at the horse. In an age and in an industry in which employees tend to jump from one opportunity to another, Felipe Pulido Mendoza was hired by Richard Mandella in 1974 and became someone the eventual Hall of Fame trainer continues to view as indispensable. Pulido Mendoza was still learning early lessons as a groom when Bad ‘n Big developed into Mandella's first big horse as winner of the Bing Crosby Stakes at Del Mar in 1978. Later, Pulido Mendoza created such a strong bond as Dare and Go's caretaker that the horse who ended Cigar's 16-race winning streak in the 1996 Pacific Classic balked at being handled by anyone else. He would violently toss his head whenever others attempted to place a halter on him. Pulido Mendoza comforted Soul of the Matter by riding with him in the cargo hold of a plane bound halfway around the world from California. Their journey led them to a second-place finish to the mighty Cigar in the 1996 Dubai World Cup. The native of Pihuamo in the state of Jalisco in Mexico never imagined the experiences he would have when he left his hometown 44 years ago at age 21. Stewart Elliott reported for work at Santa Anita Park on Thursday to find his name right there at the top of the standings, tied with Flavien Prat. Elliott’s reaction was typical of any rider in such a situation. “Yeah, man, it felt pretty good,” Elliott said. Steve Asmussen scored his 8,000th win with Lookin At Lee at Churchill Downs. Kind of a sad story, really.